At Vandenberg Air Force Base in California, the United Launch Alliance Atlas V booster and Centaur upper stage are lifted for positioning on the launch pad at Space Launch Complex 3. The rocket will launch NASA’s Interior Exploration using Seismic Investigations, Geodesy and Heat Transport, or InSight, spacecraft for its trip to Mars. 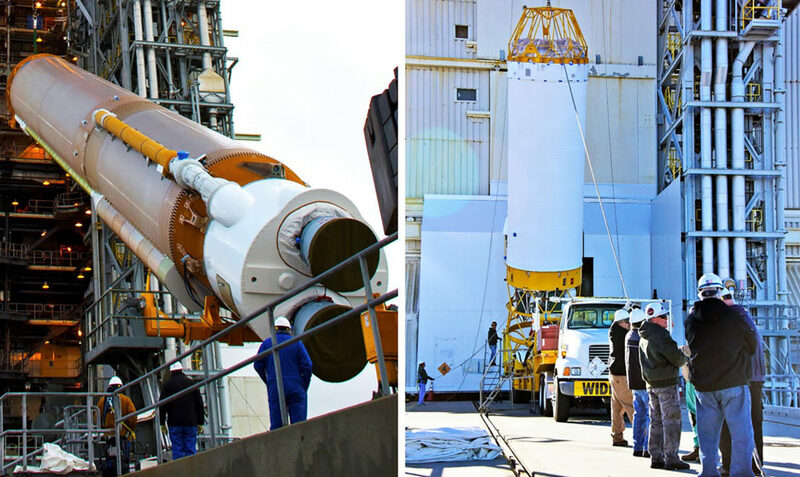 While processing of the InSight spacecraft continues in the Astrotech facility at Vandenberg, the Atlas V booster was transported to the launch pad on March 3, 2018 (photo on the left). Three days later, technicians and engineers assisted as the Centaur upper stage was mated atop the Atlas V (photo on the right). On March 8, the boattail fairing was mated atop the Centaur. The boattail is an adaptor providing an interface between the Centaur and the payload fairing encapsulating InSight. Once encapsulated in its payload faring, InSight will be transported to the launch pad and mounted atop the Atlas V. Liftoff is scheduled for May 5, 2018. InSight will be the first mission to look deep beneath the Martian surface. It will study the planet’s interior by measuring its heat output and listening for marsquakes. InSight will use the seismic waves generated by marsquakes to develop a map of the planet’s deep interior. The resulting insight into Mars’ formation will provide a better understanding of how other rocky planets, including Earth, were created.